And while it seems counterintuitive and a little redundant to add a controller to a mobile device, there’s actually a lot to gain from it. The most important of which is that no touchscreen can ever match the comfort and precision of playing with a dedicated controller. And keeping your fingers from blocking a quarter of the screen is a big plus too. 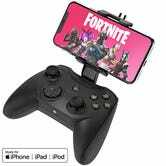 That’s particularly true in competitive games like Fortnite and PUBG, where your success hinges on quick, precise movements, making controllers a must-have. Luckily, many gamers won’t need to buy a separate controller for use with a smartphone. Depending on the device you own, you could get away with just adding an accessory or two to level up your mobile gameplay. Here we’ll run down how you’ll know if a controller is compatible with your smartphone, what features you should look out for, and which ones we would recommend. 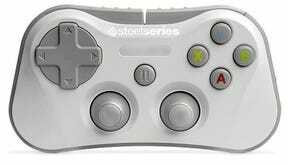 For gamers who use an Android device, you’ll have an easy time finding a compatible controller. All you need is a Bluetooth-equipped controller and you’re golden, assuming the game you’re trying to play is set up to support controllers. The Xbox One controller is one of the most comfortable controllers out there, and it’s also one of the best to play games with on your Android device. The Switch’s Joy-Con and Pro controllers can also be used, but they’re a bit pricey to recommend when the Xbox controller usually hovers around $20 less. Just be sure that it’s a modern Xbox One controller with built-in Bluetooth, as the original models didn’t include it. For a more portable option, 8Bitdo makes retro-styled, Bluetooth controllers which harness the full power of nostalgia. The SF30 gamepad, however, improves on the controllers of yore with more trigger buttons, clickable joysticks, and a rumble feature. SteelSeries, makers of some of your favorite gaming accessories, make multiple controllers for both Android and iOS devices (more on these later). Their latest model, the SteelSeries Stratus Duo, offers improved battery life and more responsive triggers. The manufacturer also offers a “SmartGrip” phone mount accessory for additional $10. 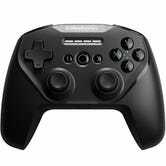 If you’re like me and want to use a controller with your iPhone, iPad or Apple TV, your choices are more limited. Despite using the same Bluetooth connection as Android devices, you’ll need to find a controller that’s labeled Made for iPhone, or MFi. And just a warning, macOS-compatible and Made for iPhone aren’t the same thing. The former works with computers, while MFi works with iPads and iPhones. By and large, your MFi choices boil down to a few SteelSeries controllers and a number of less-than-mainstream manufacturers. In fact, many MFi choices are actually sold out on Amazon. These two SteelSteries options work with iPhones and iPads; the Nimbus is larger and more comfortable to use, while the Stratus is more portable. This model from Rotor Riot is notable mostly for the built-in cradle for your smartphone, which is sold separately from most of the controllers on this list. Unless you own the Rotor Riot, your hands will be too busy gripping your controller to hold your smartphone as well. For all other controllers, you’ll need to use an accessory to attach your smartphone to your controller, like the one designed for the Xbox One and SteelSeries Nimbus below. Alternatively, you can probably use a 3D printer to make one for yourself. 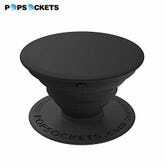 Of course, you could also use a stand, like a Popsocket or Spigen kickstand, to prop up your screen. However, that’s only an option if you’re gaming next to a stable surface or tabletop. 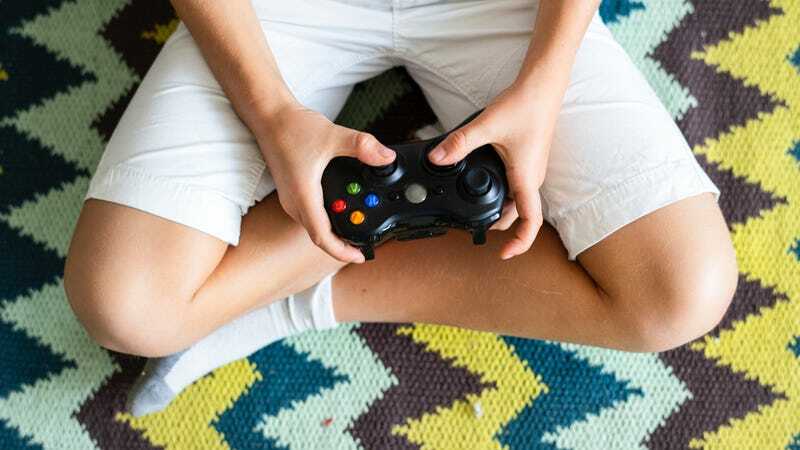 One more thing: before you buy a controller for mobile gaming, you should know that not all games support controllers and, in some competitive contexts, some users see controller use as an unfair advantage (see: cheating.) 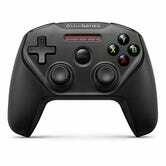 Some developers have baked in a separate queue for users who use a controller, but not all. That being said, most people (especially those who play single player games) will see immediate benefits from using a dedicated controller. There is just no denying the increased comfort and responsiveness you’ll get from a bonafide controller with tactile buttons over a slab of glass.